Contact Fort Lauderdale Truck Accident Lawyers Gerson & Schwartz, P.A. Heavy construction in Fort Lauderdale and its surrounding areas often brings large commercial trucks to the roadways. Semi-trailers, large construction vehicles, and commercial trucks often travel along the busiest highways in Fort Lauderdale. Heavily travelled roads, such as I-95, I-595, and the Turnpike, are often used by large trucks to travel to and from Fort Lauderdale. The sheer size of these trucks, often moving at high speeds, makes it difficult for them to slow down and stop. Flying debris, high speeds, and negligent driving create dangerous conditions for Fort Lauderdale drivers, often causing accidents that result in injury and sometimes death. If you or a loved one is a victim of a truck accident, contact our Fort Lauderdale truck accident lawyers at Gerson & Schwartz for help. For over 40 years, our Fort Lauderdale truck accident attorneys have helped injured clients receive the compensation they deserve and restore their lives. Our clients often have questions about recovering lost wages, obtaining and paying for medical treatment, and repairing their cars. We can help you through the process. If you’ve lost a loved one in a truck accident, we can assist you with a wrongful death truck accident claim. If you’ve suffered injuries as the result of a large truck accident and would like to speak to our Fort Lauderdale truck accident attorneys, contact Gerson & Schwartz at (305) 371-6000 for you individual and free consultation. Uncertain if you have a case? Need more information? Want to speak to a Fort Lauderdale truck accident lawyer? Then call us at Gerson & Schwartz for a free consultation. 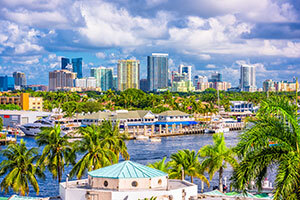 With almost 180,000 residents, Fort Lauderdale is located on the east coast of Florida in Broward County. Centrally placed, Fort Lauderdale is easily accessible from I-95, I-595, the Turnpike and US Highway 1. Known for its warm weather and pristine beaches, Fort Lauderdale is a well-known spot for tourists and second-home families. Fort Lauderdale is a thriving city with a beachfront atmosphere, fast-paced business center, several shopping malls, restaurants, as well as residential neighborhoods. New construction and road work in this popular tourist destination mean there is a significant number of large commercial trucks on the roadways in and around Fort Lauderdale. The city’s proximity to major highways and Port Everglades increases the numbers of large trucks carrying construction materials or semi-trailers transporting goods to Miami or West Palm Beach. This creates dangerous driving conditions for Fort Lauderdale drivers, often times causing accidents and injuries. Accidents involving semi-tractor trailers and other large trucks bring a different set of issues. Trucks drivers are often employed by large companies and, many times, are operating semi-tractor trailers or other commercial trucks that are company-owned. This can create a complex scenario as this increases the number of potentially responsible parties in a truck accident. Determining the liability of each responsible party, as well as insurance and legal responsibilities, may be based on different factors for each party involved making these cases tricky. Accidents involving large commercial trucks are complex cases. You don’t need to navigate these alone. If you have been injured as the result of a truck accident, give our Fort Lauderdale Truck Accident Lawyers a call today at (305) 371-6000. We listen. We help.